Still think you’re not good enough, or that golf just isn’t for you? think again! 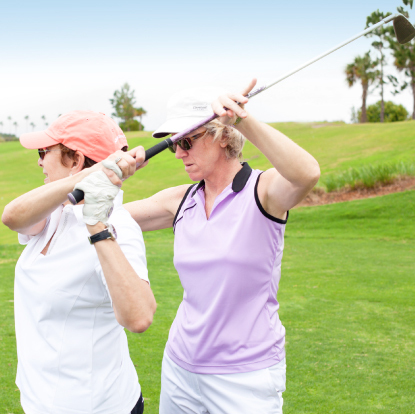 Most golfers, regardless of gender, are average golfers at best. So if you think those guys who go to business outings are so good, think again. You don’t have to be a great golfer to participate in golf business outings. You only have to be “good enough”. And it takes weeks or months, not years, to get to that level. Once you get to that level, then you are ready to play golf for business or anything else—forever. So you don’t have to take a lot of time out of your busy schedule to learn—and you just need to show up at the important outings—the ones your bosses will be happy you attend. If you’re having trouble getting invited, you MUST let everyone know you’re a golfer. Say “yes” any time someone asks if you play. Put a picture in your office so all your colleagues will know you’re a golfer, so you don’t get left out. Net net: it doesn’t matter that you play well, only that you get in the game!